In one of the most exciting games of the year, Eamon Whalen scored the golden goal in double overtime to lead the Quinnipiac Bobcats (5-4-1, 3-0-0 MAAC) over the Manhattan Jaspers (9-3, 2-2-0 MAAC) by a score of 2-1. The Bobcats were locked in a chippy affair against their rival Jaspers. In a game that featured more than its fair share of scuffles and scrums, Whalen discussed how the team kept their focus. The game had a great deal of intensity, with both teams pressing on the ball, which led to a lot of physicality. Each team had multiple chances in the first half, but none put a crooked number on the scoreboard, and the deadlock lasted the whole 45 minutes. After looking a little worn down at the end of the first half, Quinnipiac came out of the gates firing in the second. Just minutes in, Colton Grob chipped a great cross across the box to Matthew Taylor, but Taylor’s one-timer glanced off the crossbar. The Bobcats continued their onslaught through the first 15 minutes before there was finally a breakthrough. On Senior Day, it was one of the eight seniors on the team, Derek Parker, who made a crucial impact. Simon Hillinger took a corner which eventually bounced off of Jeppe Haehre to Parker, who had time to set and fire. Parker, one of the team captains, unleashed a shot that Manhattan’s Marcellin Gohier did not have a chance to save, and the Bobcats took a 1-0 lead. It was Parker’s first of the season, and he cherished the moment. After conceding the opening goal, the Jaspers upped the pressure, sending a barrage of crosses into the box that Quinnipiac could barely fend off. 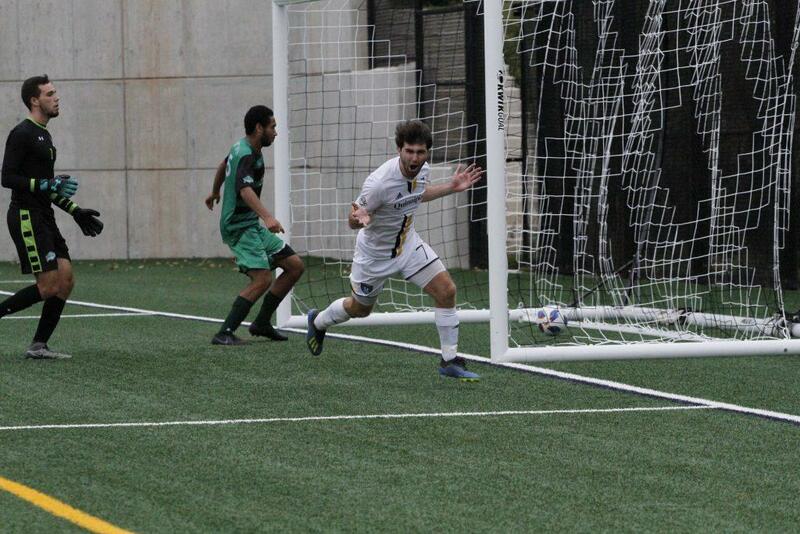 Eventually, with 15 minutes left, the Jaspers equalized – but none of their players scored the goal. On what looked to be a routine clearance play by Haehre, he misfired, sending the ball towards the goal instead of the sidelines. Normally, this wouldn’t be a problem, but Mazzola was already breaking inwards due to pressure, and so, in a stunning turn of events, he watched the ball sail over his outstretched arms and into the back of the net for an own goal and a 1-1 tie. After this goal, both teams eased up a little, and the game headed to overtime. Quinnipiac coach Eric Da Costa spoke of what was said as his team looked to respond. Both overtimes could’ve just been called “The Rashawn Dally Show”, and it would still be accurate. One of the other seniors on this Quinnipiac team, he practically willed them to a win through his work in the extra periods. Just a minute into overtime, Dally got into the box before being taken down from behind. Despite this, there was no call, and the game stayed tied. Neither team threatened much after, and a second overtime was needed. Even though Manhattan’s players had time to rest between overtimes, Dally continued to relentlessly shred them over the final 10 minutes. After he set up unsuccessful chances for Hillinger, Whalen, and Taylor, Dally took matters into his own hands. With 90 seconds left, Dally broke off one final, powerful run into the box, and uncorked a screamer at the net. Gohier laid out to deflect it, but it went right to Whalen’s foot, and he tapped it in to cap off a thrilling Bobcat victory. After the game, Whalen, a junior, summed up what this senior class taught him. Next up for Quinnipiac is a home tilt against Siena on Wednesday, as the team looks to extend their five-game win streak. As for Manhattan, they’ll try to bounce back on Wednesday when they host Rider.